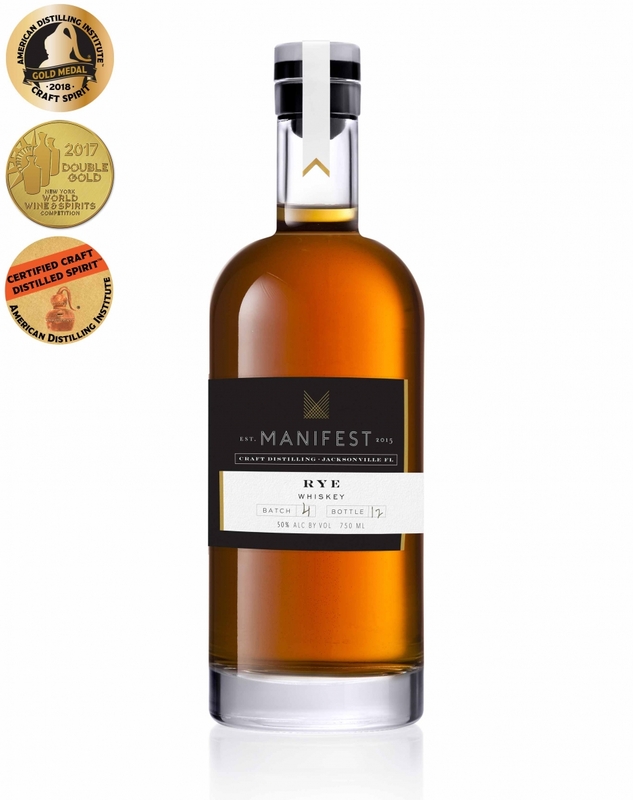 Manifest Rye Whiskey takes a classic approach to a uniquely American spirit. Using the best organic North American grains from a co-op of farm, we combine rye with hard red spring wheat to result in a slightly softened approach to Rye Whiskey. Each batch is mashed, fermented, distilled, aged and bottled at our distillery in Downtown Jacksonville, FL. 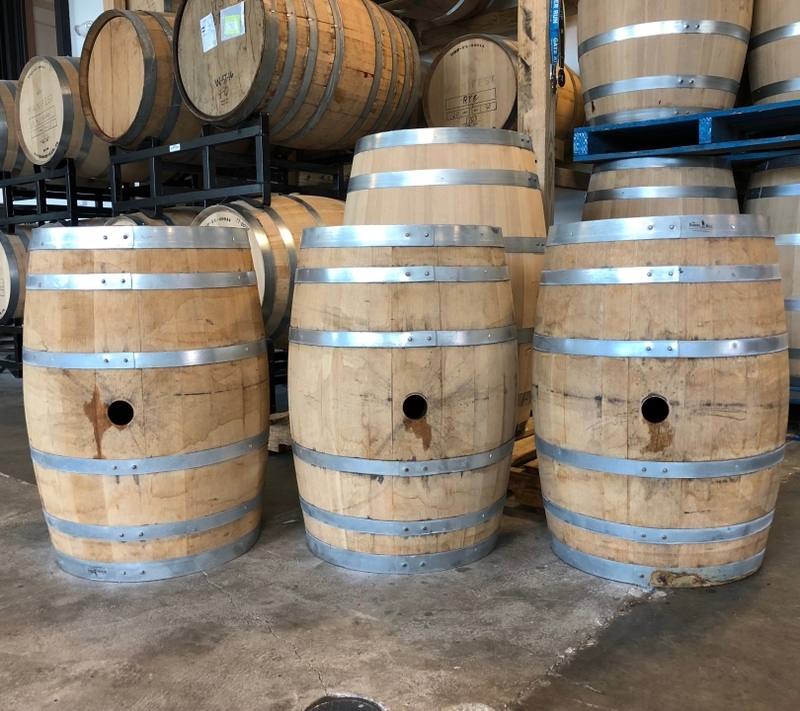 We use all American-made equipment for our production and each bottle is aged in American-grown White Oak barrels that are coopered and charred in Avon, MN. Our Rye is currently aging in a combination of 30 and 53 gallon barrels and is bottled at 100 proof. The higher bottle proof and addition of wheat to the mash bill makes the perfect Manhattan. If you're feeling froggy, try it in a Boulevardier. **Fun Fact: American Rye Whiskey dates back to the late 1700's and was the first prevalent whiskey of its day. Not until corn subsidies were put in place did Bourbon begin to replace Rye in the market place. 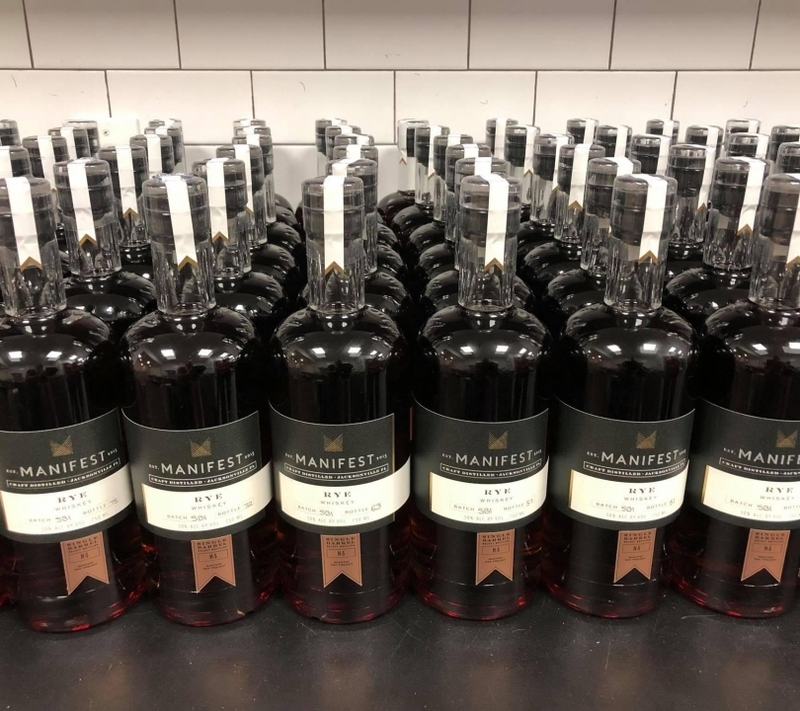 This batch marked the beginning of the Manifest Oak Project, which is a series of single barrel, distillery only releases. 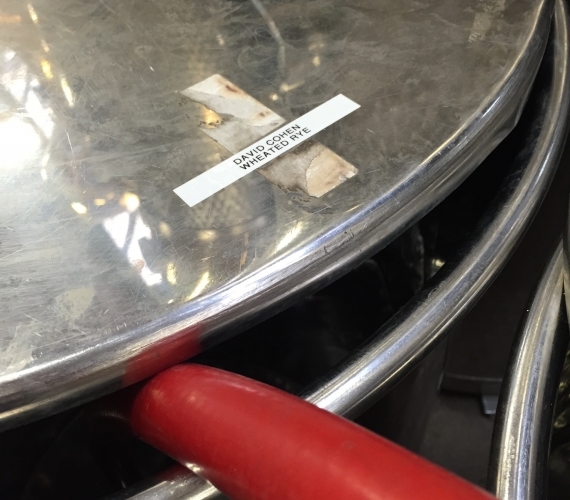 We hand select barrels that have markers making them prime candidates for a staving process. SB1 was a 148 bottle release at slightly over 16 months old. The staves used were progressively fired french oak, which are inserted into the American white oak barrel. The progressive firing process on the french oak gives specific nuances to the whiskey allowing it to show surprising complexity for its age. Batch 4 was comprised of 4 barrels for a total of 529 bottles. This bottling combined barrels that were 21 and 22 months old. The extra month spent in barrel allowed the whiskey to mellow slightly more than batch 3, rounding off some of the grain notes and introducing caramel and tropicality. Batch 3 consisted of three barrels for a total of 390 bottles. This batch was certainly the most grain dominant release to date, even though it wasn't our youngest. At 21 months old, this bottling certainly wore its grain bill on its sleeve. As we continue to hold each release a little longer, working our way to a minimum age of 24 months, it's illuminating to see the effects that our North Florida heat and humidity has on each barrel. The season it was distilled and how many climactic changes it experiences during its life dramatically changes the flavor. 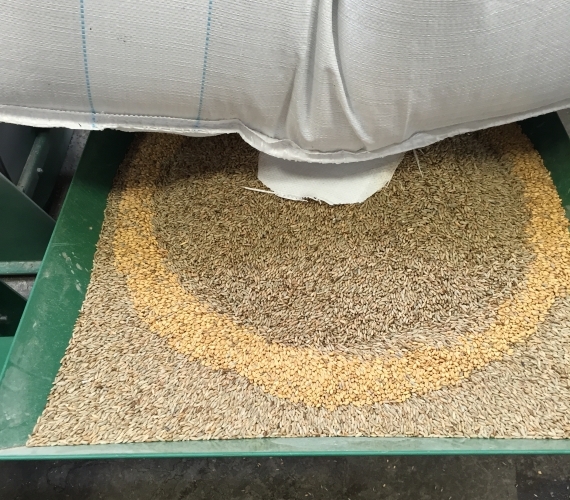 Rye batch 2 was a blend of 9 barrels at 25.5 months old that were dumped September 27, 2017. Their blended proof was 113.67 which was cut down to bottles strength of 100 proof. We ended up with 1214 bottles from this batch and lost just over 61 gallons to the Angels Share, which was over 22%. The 10th barrel from this lot was purchased by Bourbon aficionado Blake Riber and sold through Ezras.com, which is now Seelbachs.com. That barrel was dumped a little later, on December 8th, making it 27 months old. On July 29th, 2017 we released Batch #1 of our Organic Rye Whiskey. This batch consisted of 1,398 bottles which came from 10 barrels. It was dumped May 9th, 2017 at 18 months and 10 days old. Long before we opened our doors we formulated a plan to begin laying up whiskey so we didn't have to wait quite so long to get this delicious recipe into the glasses of our customers. While studying distillation science up on Goose Island in Chicago, we formed a relationship with Robert and Mark from Koval Distillery. We contracted to use their facility to finalize our mash bill and begin distilling. We ended up producing 20 thirty gallon barrels. Those 20 barrels spent 12 month aging in Koval's facility until we had a bonded premise in Jacksonville to ship them do. Once we did, we took shipment of all 20 barrels which then spent the rest of their days with us until they were dumped.